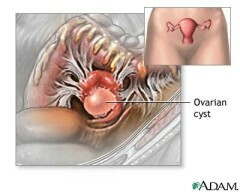 An ovarian cyst is a fluid-filled sac usually found on the surface of an ovary. You could have a single or multiple cysts. There are several types of these cysts, each with a different underlying cause. Many women will have them at some point during their childbearing years. Most are completely without symptoms. However, some types can cause serious health problems. Most are harmless "functional? or "physiologic" cysts. There are cysts that form as part of the normal function of your ovaries. Some cysts can become cancerous. These are all relatively rare cancers and are most common in women in their fifties. Cancerous ovaries are usually not painful unless they grow very large before they are discovered. Annual pelvic exams are the best method for detecting gynecologic cancers in the early, most treatable stages. Are They Related to PCOS or Polycystic Ovaries? About 10% or so of women of childbearing age develop a potentially serious hormonal and metabolic disorder known as polycystic ovarian syndrome (PCOS). Multiple cysts are a very common occurrence in PCOS. Women with this condition typically have irregular or absent periods. If the ovaries produce an abundance of egg follicles each month, but there is no ovulation and no egg is released, a series of small cysts form that often look like a pearl necklace, thus the name polycystic (poly = many). PCOS also includes hormonal disruptions that can result in persistent acne, excessive body hair, thinning scalp hair, infertility, obesity, and increased risk of diabetes, cardiovascular disease, and uterine or breast cancer. It's possible that you could have polycystic ovaries but not have this disease. If you have any kind of abdominal discomfort, could it be a cyst?or something else that is even more serious? Click here to find out what you should be looking for. Some types of cysts are harmless while others can grow as large as 4"-5" in diameter and cause a health problem. Find out which type of cysts you should be concerned about. Some women have a lot of trouble with cysts while others do not. You have more control over this problem than you think. Discover the natural method some women use to prevent unhealthy ovarian cysts. You may be surprised to know how prevalent polycystic ovaries are among young women. We came across a report in the September issue of the Gynecological Endocrinology medical journal that said about 4 of every 5 normal, healthy women have this problem. However, as women get older, the rate of this problem decreases. Note that polycystic ovaries is not the same thing as polycystic ovary syndrome. In the case of polycystic ovaries, the ovaries are larger than normal, and there are a series of undeveloped follicles that appear in clumps, somewhat like a bunch of grapes. They are not especially troublesome and may not even affect your fertility. However, when the cysts cause a hormonal imbalance, a pattern of symptoms may develop. This pattern of symptoms is called a syndrome. These symptoms are the difference between polycystic ovary syndrome and polycystic ovaries. So you can have polycystic ovaries without having PCOS. However, nearly all women with PCOS will have polycystic ovaries. The good news is that you can deal with both problems with the same approach: improved diet and lifestyle. You have two walnut-sized ovaries. These are located on either side of the uterus, nestled under the fringed ends of the fallopian or uterine tubes. These tubes create a pathway for a released egg to reach the center of the uterus. During the menstrual cycle, one ovary will develop and mature an egg. The egg is encased in a sac called a follicle. About day 14 of the menstrual cycle, ovulation occurs and the egg is released from the ovary.